WFSP Foods of Decatur, Ala., is recalling approximately 42,147 pounds of ready-to-eat chicken breast products. The products may be undercooked, producing the potential for survival of bacterial pathogens. 9-lb. 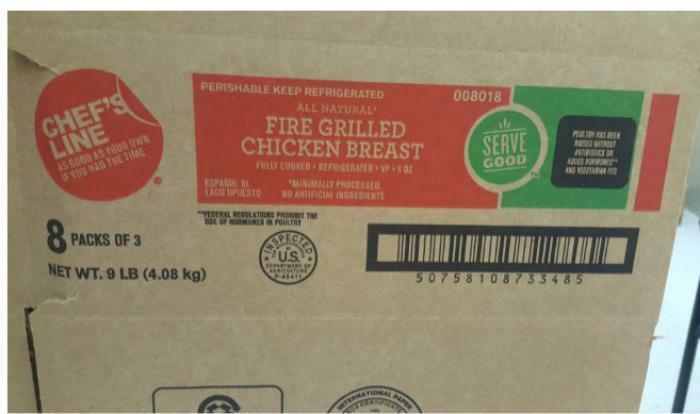 foodservice cases containing 8 poly film packages of “CHEF’S LINE ALL NATURAL FIRE GRILLED CHICKEN BREAST” with product code 22586, produced on 04/07/17, and Best by date 06/14/17. 9-lb. foodservice cases containing 8 poly film packages of “saladworks FULLY COOKED FLAME GRILLED CHICKEN BREAST FILLETS” with product code 22500, produced on 03/29/17 and Use by date 06/05/17. The recalled products, bearing establishment number “P-45411” inside the USDA mark of inspection, were shipped to a distribution center in Illinois and further distributed to hotel, restaurant and institution locations nationwide. Consumers with questions about the recall may contact Alan Sterling at (678) 450-3092.